Aaron and I met Thanksgiving Day 2006. As fate would have it, I had just moved from Lubbock to Kansas City not even a month before this encounter so, we started the "long distance relationship." We sort of got off to a rocky start, but Aaron really hung in there and pursued me like crazy! We set up some "check points" in our relationship to help manage the long distance thing. They were just little tests and if we passed we got to move on to the next step. After several road trips here and there and many tests passed, we planned a trip to Africa. Our biggest checkpoint yet! We thought, "if we can work alongside each other for two weeks in Africa then maybe we're ready to talk about getting married." Ha! 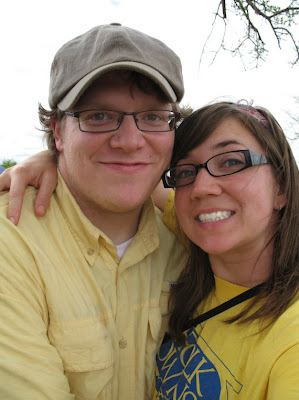 Looking back it's seems like a silly thought, but Africa was a huge building block in our relationship. Aaron had been to Africa a few times before and it changed him from the inside out. It was amazing to be able to see this beautiful place and better understand Aaron and his heart. Even more than that, it was amazing to be able to share with him in this love for Africa. We're so inspired by the people there, and the KIDS! The spirit and the strength and the hope that those kids have is unbelievable! 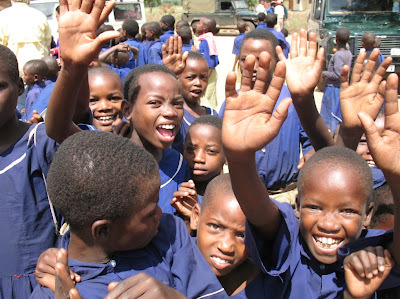 This is a picture of the kids that greeted us when we arrived at their village in Tanzania. Aaron and I are about to celebrate our two year anniversary and we're really excited to start a family. Adoption is something we've both felt really strongly about for a long time. We've heard it described as the most tangible depiction of the gospel and we can't wait to bring one of these little guys home! Because Africa is such a big part of who we are, and because we have seen such a large need for orphans there to have a home, we have decided to pursue adopting from Ethiopia.